I can’t help but think that the entire story is just following the rule of cool and that that’s where any development ends. Don’t get me wrong. This is a fairly decent issue, it gives a lot of time to the characters and the pace moves along well enough, but there was a distinct lack of substance to it for me. Not to mention the dissonance with Nightcrawler doing absolutely nothing in the entire issue, and only appearing for a single-panel cameo in the final panel. Nightcrawler was promoted heavily in the lead-up to the release of the first issue and given all of that, I’m quite surprised that this issue has almost nothing of him. This issue could very well be an issue of Jason Aaron’s Wolverine and the X-Men and I wouldn’t notice. There’s nothing “amazing” about it. Its just another adjectived X-book. Still, points given for the fact that this follows its own story and has almost no ties to everything that’s going on in Brian Michael Bendis’ X-books. This book is following its own path and I would love for it to continue along that path. Where the other books are grounded in the present with familiar villains and allies-turned-almost-villains and what not, its nice to get a book that basically takes a chill-pill and just wants to hang out and do its own little thing here. 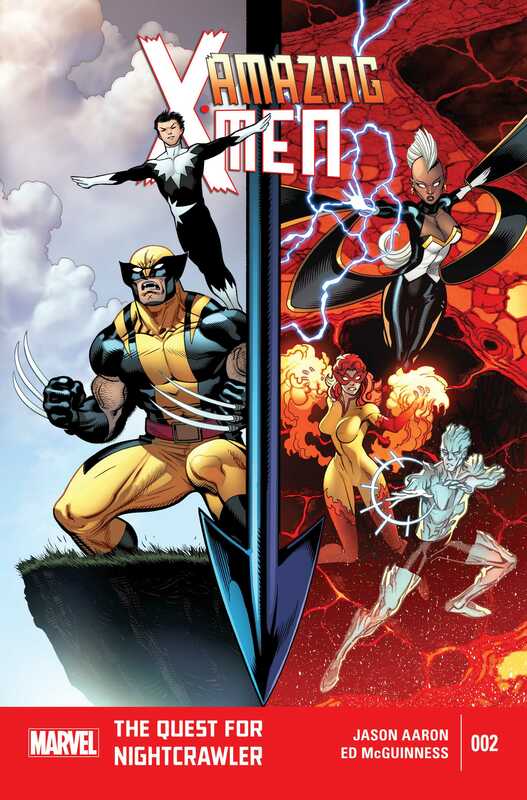 With Wolverine and Northstar in Heaven and the trio of Iceman, Storm and Firestar in Hell, there is a lot of potential for the story to really develop into something good. The little things are all there such as Azazel’s bamfing pirates attacking the demons in Hell or Wolverine and Northstar fighting on a flying pirate ship. I mean, its good stuff. Underused in this issue, but good stuff all the same. What got to me however was how much this issue was talk-talk-talk. The characters talk too much and far too many of the panels are just talking heads, even though there is some action going on in them. All the dialogue was really unnecessary since it just repeated what was happening in the panels themselves. The trio in Hell practically lay out their entire thought-process for how they figure they are in Hell. Its annoying and clumsy to read. And where the first issue ended on a decisive cliff-hanger, this one seemed more of an afterthought, and it all wrapped up in a jiffy. Quite disappointing, that. Not to mention, just where is Azazel? Last issue had him go up against Nightcrawler and he’s entirely absent this time around. Ed McGuinness is back for the internal artwork, along with inker Dexter Vines and colourist Marte Gracia. In general, I quite liked McGuinness’ work in this issue, but I did have some issues with it. Particularly, how he draws Storm. Her face is far too rounded and she appears to be extremely thin in a lot of the panels. She looks nothing like how she looks in the other X-books, especially not how she is drawn in Brian Wood’s X-Men. And the surprise guest of the issue didn’t really feel like who the character is supposed to be. Completely taking a character out of their element and putting them back in is not an approach that worked in this issue. Still, McGuinness’ work is quite good in other respects. There are a lot of big moments in the issue and McGuinness’ pencils make them all stand-out. Vines’ inks and Gracia’s colours go well with McGuinness’ pencils and the… modern look to the finished product is extremely good. I only hope that next month’s issue is significantly better, mostly in terms of the writing, and that we return to more Nightcrawler action. Posted on December 16, 2013, in Comics Reviews, Review Central and tagged Amazing X-Men, Azazel, Comics, Comics Review, Dexter Vines, Ed McGuinness, Heaven, Hell, Jason Aaron, Jean Grey School, Kurt Wagner, Marte Gracia, Marvel, Marvel Now, Mutants, Mystery, Nightcrawler, Review, Review Central, Science Fiction, Superheroes, Wolverine, X-Men. Bookmark the permalink. 1 Comment.